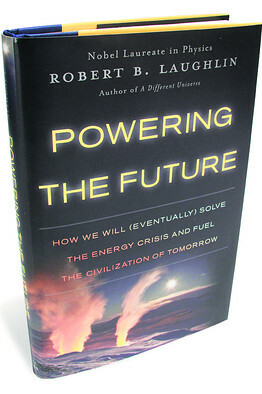 The Curious Wavefunction: Book review: Robert Laughlin's "Powering the Future"
Book review: Robert Laughlin's "Powering the Future"
In the tradition of physicists writing for the layman, Robert Laughlin has emerged as a writer who pens unusually insightful and thought-provoking books. In his "A Different Universe" he explored the consequences and limitations of reductionism-based physics for our world. In this book he takes an equally fresh look at the future of energy. The book is not meant to be a comprehensive survey of existing and upcoming technologies; instead it's more like an assortment of appetizers designed to stimulate our thinking. For those who want to know more, it offers an impressive bibliography and list of calculations which is almost as long as the book itself. Laughlin's thinking is predicated on two main premises. The first is that carbon sources are going to eventually run out or become inaccessible (either because of availability or because of legislation). However we will still largely depend on carbon because of its extraordinarily fortuitous properties like high energy density, safety and ease of transportation. But even in this scenario, simple rules of economics will trump most other considerations for a variety of different energy sources. The second premise which I found very intriguing is that we need to uncouple our thinking on climate change from that on energy instead of letting concerns about the former dictate policy about the latter. The reason is that planetary-level changes in the environment are so vast and beyond the ability of humans to control that driving a few more hybrids or curbing carbon emissions will have little effect on millennial events like the freezing or flooding of major continents. It's worth noting here that Laughlin (who has been called a climate change skeptic lately) is not denying global warming or its consequences here; it's just that he thinks that it's sort of beside the point when it comes to thinking about future energy, which will be mainly dictated by economics and prices more than anything else. I found this to be a commonsense approach based on an appreciation of human nature. With this background Laughlin takes a sweeping and eclectic look at several interesting technologies and energy sources including nuclear energy, biofuels, energy from trash, wind and solar power and energy stored beneath the sea. In each case Laughlin explores a variety of problems and promises associated with these sources. Because of dwindling uranium resources, the truly useful form of nuclear energy for instance will come from fast breeder reactors which produce their own plutonium fuel. However these reactors are more susceptible to concerns about proliferation and theft. Laughlin thinks that a worldwide, tightly controlled system of providing fuel rods to nations would allow us to fruitfully deploy nuclear power. One of his startling predictions is the possibility that we may put up with occasional Chernobyl-like events if nuclear power truly becomes cheap and we don't have any other alternatives. Laughlin also finds promises and pitfalls in solar energy. The basic problem with solar energy is its irregular availability and problems with storage. Backup power inevitably depends on fossil fuel sources which sort of defeats the purpose. Laughlin sees a bright future for molten salt tanks which can very efficiently store solar energy as heat and which can be used when the sun is not shining. These salts are simple eutectic mixtures of potassium and sodium nitrates with melting points that are conveniently lowered even more by the salts' decomposition products. Biofuels also get an interesting treatment in the book. One big advantage of biofuels is that they are both sources and sinks of carbon. Laughlin talks about some recent promising work with algae but cautions that meeting the sheer worldwide demand for energy with biofuels that don't divert resources away from food is very challenging. Further on there's a very intriguing chapter on energy stored under the sea. The sea provides a stupendous amount of land beneath it and could be used for energy storage through novel sources like high-density brine pools and compressed natural gas tanks. Finally, burning trash which has a lot of carbon might appear like a useful source of energy but as Laughlin explains, the actual energy in trash will provide only a fraction of our needs. Overall the book presents a very thought-provoking treatment of the nature and economics of possible future energy sources in a carbon-strapped world. In these discussions Laughlin wisely avoids taking sides, realizing how fraught with complexity and ambiguity future energy production is. Instead he simply offers his own eclectic thoughts on the pros and cons of energy-related topics which may (or may not) prove important in the future. Of the minor gripes I have with the volume is the lack of discussion of promising recent advances in solar cell design, thorium-based fuels and next generation nuclear reactor technology. Laughlin's focus is also sometimes a little odd and meandering; for instance at one point he spends an inordinate amount of time talking about interesting aspects of robotic technology that may make deep sea energy sequestration possible. But these gripes detract little from the volume which is not really supposed to be an exhaustive survey of alternative energy technologies. Instead it offers us a very smart scientist's miscellaneous musings on energy dictated by commonsense assumptions based on the simple laws of demand and supply and of human nature. As responsible citizens we need to be informed on our energy choices which are almost certainly going to become more difficult and constrained in the future. Laughlin's book along with others will stimulate our thinking and help us pick our options and chart our direction. Interesting, especially the argument about decoupling climate policy from our thinking on the energy crisis -- although they are closely related, there are certain considerations unique to each. I'm a little surprised he would argue climate is beyond our power to control, however, because the current period of climate change is a direct result of human activity, and the current period of rapid human-induced climate change is what we are concerned about (not more long-term fluctuations). Is he arguing that the political and economic challenges we would need to meet to reduce CO2 emissions are simply insurmountable in the short term? In that case, unfortunately, I might have to agree. I don't like to be pessimistic, but at this point it would take a miracle to get world leadership to agree on a coherent international climate change policy -- (heck, let alone get Congress to agree on a coherent policy), so it may well be true that while we could definitely reduce emissions in theory, in practice the political realities make progress on this problem unlikely.